Enumerate Circulating Tumor Cells easily and reliably with limited hands-on time. 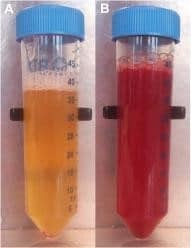 The size based filtration uses the larger size and higher rigidity of circulating tumor cells compared to other blood cells. Epcam positive and Epcam negative cells will be captured on the microsieve. In the Cellsearch system only Epcam positive cells will be captured. 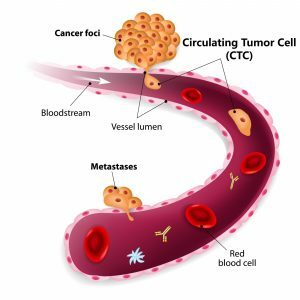 VyCAP offers a complete, simple, validated and automated solution to enumerate CTC in the blood of cancer patients. The system is easy and flexible. Additional labels can be added to the cells which is ideal for research. The workflow to enumerate CTCs in human whole blood samples is validated, automated and simple. It takes less than 1 hr to process a sample and enumerate the circulating tumor cells. Our protocols for labeling are based on commercially available reagents. If you wish to use a different immuno-fluorescence label, the protocol can easily be modified for your purpose. The graphs below present the recoveries of SKBR-3 and PC-3 cells spiked in CellSave blood of healthy donors. Blood is filtered using VyCAP’s enumeration disposable and imaged and enumerated using VyCAP’s imaging system. After labeling, mounting medium containing DAPI is added and a coverglass is applied. 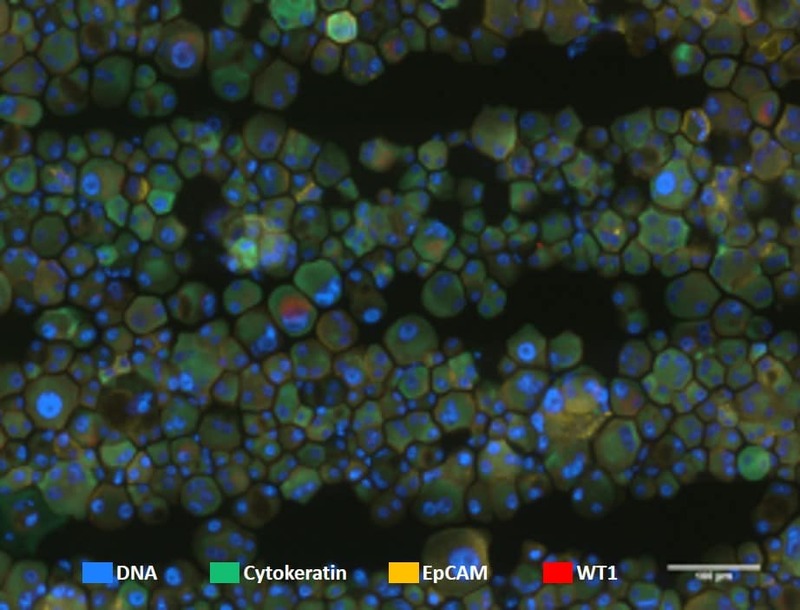 The coverglass is added to obtain high quality images and prevent sample degradation. Example images of labelled cells on the microsieve are depicted below. The images are acquired with VyCAP’s imaging system. After urine collection the sample is fixed by addition of EtOH/AcOH (3:1) in a 1:1 ratio. Subsequently the urine is filtered and cells on the microsieve filter are labelled. After the cells are labelled the slide is placed on the VyCAP imaging system. The fluorescent images are acquired. The images are automatically processed to enumerate CTC using VyCAP’s software or ACCEPT. Pleural fluid was obtained by a thoracentesis, an invasive procedure to remove fluid from the pleural space. The fluid was tapped from the pleural space and transferred to a 50 ml tube. To remove clots the pleural fluid was pre-filtered using a nylon mesh filter (pores of 150 µm). Next the sample was transferred to the filtration disposable. A small negative pressure of 50 mbar was used to filter 2.5 ml of pleural fluid. Fluorescence images of the stained cells were acquired. Images show cells on the microsieve using a 40x objective.